And the frightened ‘bird‘ flew away. The ‘bird’ was thoroughly ‘embarrassed‘. For them, ‘age was only a number‘. And with them, a ‘knee-jerk‘ ‘goodbye‘ would be unnecessary. Who needed to be ‘mentally strong‘ and overcome a ‘mental block‘. They needed to be ‘Keyboard Saints‘. The ‘verbal abuse‘ had been thoroughly unnecessary. He ‘flipped‘ it and spoke of mothers and sisters! The argument/bird might circle in, on a ‘rank turner‘. OK, India won the series and it is significant in more ways than one. But, what a let down the last day of the 2nd Test between India and England turned out to be? What irks me is not the fact that India didn’t win the match, it’s just that India didn’t try. Granted, the pitch did not deteriorate as much as people thought it would and England could have still played out a draw. But we will never know, will we? Dhoni as a leader, probably went a notch up in the books of Yuvraj and Gambhir for allowing them to try and go for their hundreds and individual glory. But at what cost? Dhoni’s first duty should have been to try and win the match, not let players play for their personal glory. In an ironic sort of way – both players missed out on their centuries and in a way, I think justice was served. After playing adventurous and bravado-laden, aggressive cricket on day-1 and day-2, India had choked Australia almost out of the game on day-3 of this intriguing Test match. In a strange manner, India played the “new age cricket” that Australia was threatening to play all along in this series. Up until day-3 Australia had failed to execute that brand of cricket. And on day-3 when they were faced with an opposition that played new age cricket, they had no answers! India had a hand on the Border-Gavaskar Trophy and needed a few sessions more of good cricket to get both hands on it! The 1st Session went to plan for India. Virender Sehwag and debutant M. Vijay played sensibly and countered everything that Ricky Ponting threw at them. Ponting was caught between two lands. He could not afford to over-attack. He could not afford to defend either. It is not often that Australia finds itself in this position. And today, I am not sure they got their tactics right. Jason Krejza was bowling impressively. But the Indian openers had no fears. They played him and Brett Lee, Mitchell Johnson and Shane Watson with much ease. I am not sure why we didn’t see Simon Katich! The over rate wasn’t great either. India went into lunch on 98-0 off 27 overs. Only 26 overs had been bowled in the mornings’ session. Was Australia the team that was supposed to be “making the running” in this match? I wasn’t sure. The run rate was hovering around 3.6 rpo. Virender Sehwag had reached his half century and Vijay was playing with much composure and tightness. An early thought: Why not include Vijay and Gambhir as openers against England and allow Sehwag to drop in at #3 as Ganguly’s replacement? The second session of the days’ play was a disaster for India. Of course, the Australians bowled exceedingly well and to tight lines. However, what really happened was a mindset issue. India started after lunch in brilliant manner. Virender Sehwag was batting positively and treated Jason Krejza with disdain. But then Shane Watson was getting some reverse swing and got M. Vijay LBW of a ball that dipped in. And this set the trend for the rest of the afternoon. At this stage, India was completely on top. Immediately after this, Dhoni made his first major error. He sent in Dravid ahead of Laxman. Laxman was the in-form batsman and he should have gone out to bat. Instead, we had Dravid and frankly, he made the bowlers look better than they actually were. Dravid is tentative and unsure. He needs time off in the Ranji Trophy to get his game fixed. But here, he ought to have batted at #5 or #6. India needed to carry the momentum. Instead, Dravid played right into Australia’s hands. Of course, he got out for not much. Immediately after that Sehwag was out caught down the legside for the second time in the series. And this set the rot. Tendulkar and Laxman batted as if they were rabbits caught in the headlights. Instead of keeping the scoreboard ticking, they slipped into a defensive mindset. The momentum had shifted. Laxman got out to a beauty from Jason Krejza that bounced, turned and crashed into his leg stump. A brilliant ball by an enterprising bowler. Australia had a hero. He became a bigger hero when he got Ganguly caught and bowled for a first ball duck! On his last appearance for India, Ganguly, who had received an ovation from each and every Australian cricketer on the field, was out for a first ball duck! The man who had drama follow him all his life, had created his own drama to join the ranks of Don Bradman, who also got a duck off his last Test innings! The last nail in the coffin was hammered by a freakish run out of Tendulkar off the last ball before Tea. This was a nightmare session for India and, from an unenviable winning position, India was just 252 runs ahead. India had made 68 runs in the session and lost 6 wickets! I am convinced that this was triggered as much by good bowling as it was by the Dhoni decision to send Dravid in at #3. The problem that was commenced by the decision to send Dravid in at #3 was compounded by the fact that Laxman and Tendulkar were caught in an intensely negative mindset. The just didn’t take the singles and just didn’t keep the scoreboard moving. Indeed, at this stage, Australia looks odds-on favourite to win the match! Was the good work over the entire series by the Indians being undone by one terrible session here at Nagpur? Was the somewhat lacklustre showing by the Indians in this last session the lifeline that this champion team from Australia looking for? Will the Australians grab it and run all over the Indians? Time will tell. An important 3rd Session was coming up for both teams. As much as the Indians had played badly, it is true that Jason Krejza bowled excellently well. Here was a star that was born for Australia. It is a huge call to make, but I am reasonably that, along with Ajantha Mendis, we had seen the birth of another spinning star in world cricket. In the lunch-tea session, there was a ball tampering incident that may get the match referee, Chris Broad quite interested. Cameron White was shown plucking leather off the scuffed up side of the ball. This was just before the ball started reverse-swinging. Although Cameron White wasn’t picking at the seam, he certainly did pick at the leather. It is fair to say that he did alter the condition of the ball. Will Chris Broad have the guts to ping an Australian though? At Tea, just 50 overs had been bowled in the day and there was nary a breath from Mark Waugh and Nick McCrdle on this issue! Australia was 10 overs short at this stage and let’s remember that Australia was the team that had to force the pace in this match? Is this the second issue for the Chris Brad to contend with in the days’ play? Will Chris Broad have the guts to ping the Australian captain though? Australia started off the post-Tea session with Jason Krejza at one end and with Cameron White and then Michael Hussey! Clearly, Australia wanted to get a move on on the over-rate! Perhaps Chris Broad had warned these Saintly Australians that he may have no choice but to suspend the Australian captain for a Test match for their over-rate recalcitrance! With Cameron White and Michael Hussey bowling, the foot had been lifted off the pedal, it seemed. Both White and Hussey had allowed the two Indian batsmen to settle in! Gone was the reverse swing! Gone was the pressure at the other end! But given the Australian bowling over-rate recalcitrance right through this series, was winning this Test match and retaining the Border-Gavaskar Trophy more important than saving the captain from a suspension? Australia had clearly lost the plot after Tea! Australia had been sloppy in the first two sessions of the day (as they have been for well over a year now)! How they could be sloppy when they were supposed to be making the running in the game, only Ricky Ponting and the Australia Team will know. However, to compound one unprofessional mistake with the bowling of White (first) and then Hussey was just sheer unprofessional cricket from these Australians. Someone needs to stick a Diwali firecracker up their collective backsides! Instead of going for the jugular, they let the pressure off the Indians. About 52 minutes after Tea, India was nearly 300 runs ahead (298 to be precise). At this stage, Australia had 27 overs left to be bowled in the day, with just 70 minutes left in the days’ play. The partnership between Dhoni and Harbhajan Singh was already worth 50 runs. This was sloppy, unprofessional cricket that was totally unbecoming of a champion side. India consolidated its position slowly and steadily. Thanks to some poor over rates and poor bowling pair in operation as a result of this, with 40 minutes to go in the days’ play, 19 overs were left in the days’ play and the partnership was already worth 82 off 128 balls! Once again, when it mattered most, Australia had not been able to step up to the plate in this series! With an hour to go to the extended days’ play, Australia needed to bowl 17 overs in the day. The partnership was worth 101 between Harbhajan Singh and Dhoni. The wheels had come off the Australians carriage. Partly through their own unprofessionalism. But partly through some courageous and positive-mindset batting from Dhoni and Harbhajan Singh. The 100 partnership came off just 150 balls. It was unfortunate for Jason Krejza really. He was bowling splendidly. But, instead of pressure at the other end, after Tea, he had Cameron White, Michael Hussey and Michael Clarke as his bowling partners! This just wasn’t good enough from the Australians. They had completely lost the plot. From a match-saving mode, India was now in target-setting mode! And it all happened in one hour of extremely sloppy play from Australia. I think Australia lost the series in that one hour of terrible cricket post-Tea. Finally, Shane Watson was back in the attack with 45 minutes to go to the extended days’ play and with 15 overs still left in the days’ play! So what did the hand-off-the-jugular achieve from Australia? I just don’t know. Against the run of play, suddenly Dhoni was out for 55 off 81 balls. He tried to sweep a Jason Krejza ball from off to leg as he had been doing all innings. The ball seemed to bounce off his boot to be cleanly and wonderfully caught by Michael Hussey. The score was 274-7. The partnership was worth 108 runs from 27.2 overs at a rate of 3.95 rpo. Krejza had his 3rd wicket for the innings. The Indian lead was worth 360 runs now. Perhaps this match was beyond Australia’s reach now? It would need a Herculean effort from Ausralia to make it from this position. Another way to look at it would be that IF Australia make a victory from this position, they absolutely deserve to win and to retain the Border-Gavaskar Trophy. At this stage, Krejza had conceded 354 runs for 11 wickets in the game! Only the West Indian Scott had conceded more runs in a Test with 374 runs for 9 wickets. Soon, Harbhajan Singh had scored his half century. Once again, he was a thorn in the Australian Team’s side. On a day when both Andrew Symonds and Ricky Ponting had their well-timed pre-Christmas book releases that touched on the “Monkeygate” episode, Harbhajan Singh had responded with the bat rather than the pen. And what matters most is responses with ball and bat. India’s 8th wicket was down to a freakish caught behind by Haddin off Krejza, who now had his 4th wicket for the Innings. Zaheer Khan had to go after an attempted sweep caught his glove. The resulting lob was pouched on the 3rd attempt by Haddin. The score was 286 for 8 and the lead was 372. Immediately afterwards, Harbhajan Singh was bowled for 52 off 94 balls by Shane Watson. It was the end of a superb hand from this feisty Sikh who has taken an immense liking for the Australians of late! This wicket begged the question: Why could Shane Watson have not continued bowling after Tea? What’s the worst that could have happened? A Ricky Ponting suspension? Was Ponting’s suspension worth more than the teams’ chances in the Border-Gavaskar Trophy? These are questions that just have to be asked. With half an hour left in the days’ play, Australia still had 12 overs to bowl! The White-Hussey-Clarke experiment had pulled things back a bit for Australia — but not much! Still the team was in the dog house. No two ways about it! I’d really like to know what the Match Referee does with Cameron White (ball tampering) and Ricky Ponting (bowling over-rate sloppiness). My sense is that Chris Broad will let both of these offenders off. India was all out for 295 with Shane Watson getting the last wicket to fall. Watson had got 4 wickets. Australia needed 382 for a win and 13 of these were wiped off in the very first over from Zaheer Khan! I do think that the plan for India would be to keep it tight at one end and attack from the other end. With 4 balls left in the days’ play, light was offered to Australia and Hayden accepted the light! When India sent in a night watchman in Delhi, Mark Waugh, Malcolm Conn and Chloe Saltau went into paroxysms, describing it as a ‘negative’ move. It will be interesting to see what their reaction is to this offering from Australia! But more than anything else, I will be interested in seeing what the Match Referee does today. India had a wonderful last session of play. This was more due to Ricky Ponting’s strange and bizarre tactics. Of course, Dhoni and Harbhajan Singh played sensationally well. But Ponting’s tactics contributed immensely to the free spirit with which they played. Ricky Ponting may have a lot of luck with the Match Referee who has been blind to Australia’s over-rate recalcitrance in all recent Tests. However, one thing that Ricky Ponting has bad luck with is the recent run of tosses! He lost even to Anil Kumble, a man notorious for bad toss-luck! M. S. Dhoni won the toss and elected to bat. As expected, Harbhajan Singh replaced the retired Anil Kumble and M. Vijay came in for Gautam Gambhir who was rubbed out of this game without a proper appeal! The young opener from Tamil Nadu came in on the back of a double century in the Tamil Nadu game against Maharashtra. Indeed, that TN-Maharashtra Ranji Trophy game only concludes today! Vijay was pulled out of that game after scoring a record opening stand of 462 in the company of the immensely talented 19-year-old, Abhinav Mukund. Incidentally, Abhinav Mukund, a stylish left-hander and son of former TN player Mukund, went on to make a 300 in that game. I wrote in my preview of this Test match that Australia had to take Jason Krejza instead of Cameron White and perhaps, Peter Siddle instead of Shane Watson. Instead, however, Jason Krejza came in for Stuart Clark! Shane Watson and Cameron White remained in the side. This was, in my view, a strange tactic from Ponting. Only time will tell if it pays off for the Australians. The pre-drinks session belonged to India. Australia started off with a Brett Lee wide — it ought to have been two wides in a row really, to match Steve Harmison’s start to the Gabba Test. India started off in a hurry. The rest of the first hour was roughly similar apart from a few false shots and inside edges from the Indian openers. I was particularly impressed with Murali Vijay. He played with utmost composure a cool head and a tight technique. When he came forward to meet the ball, he did so in an assured manner. When he rocked back, his balance was brilliant. Just before the drinks’ break, Jason Krejza came in for a bowl. Sehwag hit him for a 4 and a 6 in the same over. Perhaps this was a sign of things to come? However, there were a few good signs for the Australians. The pitch had bounce and offered some spin. However, most interestingly, the top soil was already starting to crumble! With the score on 98, Shane Watson bowled a few well-directed bouncers at M. Vijay who ducked easily into these. However, this was followed by another one closer to Mijay’s body. The ball squared him up and the resulting poke was taken by Brad Haddin. M. Vijay had made 33 off 53 balls and the score was 98-1! At the other end, Sehwag faced up to Jason Krejza who had figures at this stage of 3-0-32-0. However, he was getting some sharp spin and unnerving bounce! Sehwag’s strategy to the first ball he faced from Krejza was strange; he attempted a reverse sweep! At this stage, Sehwag had scored 63 off 58 balls! I didn’t quite see the need for a reverse sweep, but then that’s how the man plays! The fall of Vijay brought Dravid to the crease. Off the very first ball he faced from Krejza, Dravid lunged forward tentatively and poked the ball off the front foot. The ball bounced awkwardly, ripped and cluttered into his pads before travelling into the safe hands of Simon Katich at forward short leg! Dravid, after looking solid, but unlucky at Bengaluru, Mohali and Delhi, was out for a disconcerting duck off the second ball he faced! This was good bowling by Krejza and underlined the folly of Australia not including him in previous Test matches. Soon after, the score was 116-3 when Jason Krejza induced a lazy glide off the back foot from Virender Sehwag. With just 5 minutes to go for lunch, this was perhaps a play-for-lunch shot. The ball took the under-edge of the bat and crashed into the stumps. Krejza had his second wicket in Test cricket! Sehwag was out for 66 off 69 balls with 9 4s and 1 six!. India was 116-3 off 22.3 overs! V. V. S. Laxman, in his 100th Test match, caressed the first ball he received for an off-driven 3 runs. India found herself in a hole of her own making really! Jason Krejza was able to crowd the bat with 3-4 fielders now. At lunch, India was on 122-3 off 24 overs! Only 24 overs were possible by the Australians in a two hour session! But the Match Referee will continue to look to take candy money from a few Australians before training his sights on the over rate! India had an excellent start to the session, but blew it towards the end with about 25 minutes of madness. My Session by Session (SBS) scoring gives this session to Australia. The SBS Score reads: India-0, Australia-1.0! 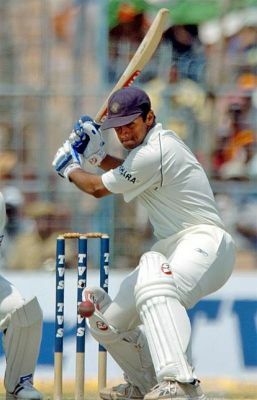 India started the 2nd Session on 122-3 (a run rate of 4.80) with Laxman on 4 off 5 balls and Tendulkar on 16 off 16 balls. I suspect Harbhajan Singh, Amit Mishra and Virender Sehwag would like what they saw of the pre-lunch session. Krejza was able to extract spin and bounce from the pitch! It would be an early call and it is potentially foolish to make a call on an Indian pitch, especially when one is a few thousand miles away and watching on TV! However, I have a feeling that a score of 400 or so in the 1st innings would be quite competitive! The surface was already crumbling and there already was a bowlers’ rough! And we have just completed the 1st Session of the match! Having said this, I realise Dravid got out to a poke and Sehwag got out to a lazy shot. Yet, what was disconcerting was the bounce and spin that Krejza was getting. Australia are in a good position despite the brisk scoring from the Indians. Despite going for nearly 8 runs per over at this stage (6-0-48-2), Krejza was actually bowling quite well. He was getting good spin and bounce. His top spin was also working for him and he was able to extract good bounce from it. I didn’t see anything that went on with the arm though and that may make him somewhat predictable perhaps. There was a pointer though for me that was good about the first session. India didn’t look like a team playing for a draw! This could play into Australia’s hands. Australia started off after lunch with Jason Krejza and Mitchell Johnson. Mitchell Johnson started off with a 7-2 off-side field. This meant a lot of off-side bowling! This was a somewhat strange tactic from a team that had to win the match! Agreed this was just Session-2 of a long Test match, but I couldn’t quite understand this from Australia. Sachin Tendulkar, who faced most of these balls, was having nothing to do with these. Perhaps Australia wanted to attack at one end and slow things down at the other end? Having said that, the first time Johnson strayed onto the pads, Tendulkar was able to whip it through mid-wicket for a four. Still, Johnson continued with a 7-2 field. Ponting’s approach was to give his pace bowlers short bursts of 4-5 overs. It was a hot day. Nine overs after lunch, Mitchell Johnson was replaced by Brett Lee. India had added 27 runs in the 9 overs after lunch. It was India’s turn to consolidate. The Australian pace bowlers continued to bowl outside off stump although Brett Lee did catch Laxman flush on the shoulder from a fast in-ducking bouncer! Krejza was bowling steadily and was getting some slow spin and bounce. His figures read a more respectable: 12-1-74-2! He even bowled a maiden over! The ball was 37 overs old now and was showing some signs of reverse swing. Brett Lee produced an in-swinging yorker, which Laxman kept out. This was starting to make the game just a little interesting. We had an off-spinner playing his first Test match, able to extract some slow spin and bounce from the pitch. We also had a paceman steaming in to bowl with fire at two well set batsmen who were quite intent on staying there. This was absorbing Test match cricket. The 50 of the partnership came off a strange, false shot from Laxman! A Jason Krejza ball gripped the surface, bounced and turned a bit. Laxman was into his trademark whip-flick shot before the ball arrived at him. The ball stopped a bit too. The resulting shot just lobbed agonisingly over the head of mid-wicket to reach the boundary fence. Tendulkar and Laxman had made their 50 runs from 14.3 overs at a rate of 3.44 rpo. Tendulkar was on 41 from 55 balls and Laxman was on 19 from 44 balls. Tendulkar was batting wonderfully. There were no histrionics or thumping off drives. This was a relaxed and in-the-zone outing for Tendulkar. He was looking good. Drinks was called at this stage. At this point, Jason Krejza had bowled unchanged since he was introduced! Although he had given away a few runs, it highlighted once again why Krejza’s absence from the team in the first three Tests was beyond belief. In Jason Krejza’s 14th over on the trot (39th over of the innings) he even bowled from around the wickets. I was getting more and more impressed with this Australian bowler. He wasn’t frightened of tossing it up. He wasn’t fearful of the reputations of the batsmen he was bowling to. Perhaps he had the “temerity” too huh? In Krejza’s next over, Tendulkar got his half century. He had had a wonderful landmark-loaded series without scoring a big one. This was his 52nd half-century, and with it, Tendulkar had scored his 91st score of 50 or more runs — the highest for any player in the world. The records continued to fall his way. However, he would perhaps agree that nothing would matter to him more than a big match-winning score here. In the 42nd over Cameron White came in for his first bowl of the match. At the other end, Shane Watson replaced Brett Lee. The ball was starting to “reverse” just that little bit. There was something in it for the pace bowlers now. Perhaps Stuart Clark will have made better use of the conditions? One will never know. Cameron White had figures of 3-1-3-0 at the end of his 3rd over. However, truth be told. He bowled nonsense really. Most of his balls were nearly a foot outside off stump. But perhaps he was part of the ‘holding pattern’ for this pair (Watson-White) of Australian bowlers. At Tea India was 202-3 off 51 overs at a rate of just under 4 rpo. In that session, 27 overs had been bowled for 80 runs. India hadn’t lost a wicket in that session in which its run rate was 2.96 rpo. It was a steadying session for India. India won the session and the SBS Score reads: India-1.0, Australia-1.0! Up until Tea on day-1 Australia had bowled 51 overs! Of these, 20 overs had been bowled by spinners! This was beyond sloppy territory. The was beyond unprofessional territory. This was even beyond recalcitrance. This was beyond thumb-nose-at-establishment territory even. I am thoroughly gob-smacked that Chris Broad will still do nothing about it! If Ricky Ponting is serious about getting even with the bowling rate, I’d expect Jason Krejza and Cameron White to do a large bulk of the bowling from overs 50-80 before the new ball is due. It will be interesting to see how this session plays out in this regard. But for me, it will be interesting to see when the Match Referee stops this blatant and continuous insult to the game of cricket itself! After Tea, Australia started proceedings with Cameron White and Shane Watson. Cameron White continued to bowl nonsense. The 100 partnership was soon secured. Laxman had 38 runs from 102 balls while 73 from just 103 balls! I hadn’t quite realised that at that stage these two had faced almost the same number of deliveries! Perhaps Cameron White had bowled more nonsense to Laxman than to Tendulkar. Soon after the century partnership, Tendulkar and Laxman attempted to run the worst run I have seen in a long time! Jason Krejza who collected the ball could have said a brief prayer and composed a song before throwing the ball at the stumps! Tendulkar would have still been out! However, Krejza’s snap throw was wide of the stumps. Tendulkar who had given up on the run arrived in the TV frame a few seconds later! This was the first wrong step that Krejza had made all day! As if to punish him for that, Ponting had him into the attack the very next over! Cameron White switched ends and bowled instead of Shane Watson. But it was a case of different ends, same nonsense from White though! Somehow in this session it looked as if the bite and fizz had been lost in this pitch for the spinners. Krejza wasn’t able to get the bite and purchase that he had received in the 1st Session. I did like how he bowled though. He wasn’t afraid to flight the ball and he copped the occasional hammering that he received. The two Indian batsmen had pitched their tents for the long haul. This was again an example of khadoos batting. The Australians looked a bit lost. But having said that, this did appear to be a pitch on which one wicket could lead to a clatter of them! It would be interesting to see Simon Katich in for Cameron White who, in my view, was wasting balls. In his 18th over, Krejza had given his 100th run for his 2 wickets. When on 85, with India on 241, Tendulkar miscued an off drive off Jason Krejza. The resulting skier seemed to stay in the skies for an eternity! Mitchell Johnson would have had ample time to say a prayer and compose a song before it landed down on him. Like Ishant Sharma had at Delhi, Mitchell Johnson had dropped an important catch. Had he drop the Border Gavaskar Trophy with it? Too early to tell really. But that was an easy catch if ever there was one! The very next ball, on his 100th Test match, Laxman had a half-century. Australia needed a wicket badly at that stage and Mitchell Johnson had let the team down. Just as he brought Jason Krejza to bowl after being the the culprit of a Tendulkar run-out let-off, Ponting now got Mitchell Johnson in for a bowl. He replaced a listless Cameron White. The catch drop seemed to have sapped the energy of the Australians. Heads drooped. Shoulders dropped. But there was hope. All Australia needed was a wicket or two, one felt. Wickets would always fall in a heap on this pitch, I felt. Krejza continued to bowl well at both batsmen. However, for both batsmen the field was well spread. So, they were able to pick the singles and rotate the strike reasonably easily and soon Tendulkar stepped into the 90s for the first time in the series. Against the run of play, V. V. S. Laxman tried to play a cut to a ball from Jason Krejza that just gripped, turned a bounced a bit. The resulting edge got stuck between Haddin’s legs and India had lost the 4th wicket at the score of 262. Laxman was out for 64 off 141 balls with 5 boundary hits. The partnership was worth 146 runs off 46.1 (at a rate of 3.16 rpo). Laxman will have wanted a century in his 100th Test and like Sehwag, looked set for it. But like Sehwag, he too was out in the 60s! Sourav Ganguly came out to play in his last Test match. When on 96, Tendulkar was let down again off Jason Krejza. An off-drive hung in the air for a long time long time. Brett Lee dropped the resulting hard chance. Given his recent trend of getting out in the 80s and 90s, perhaps Tendulkar was looking a bit nervous and edgy out there? But then, perhaps this was Tendulkar’s day after all? My question was whether Ponting would bowl Brett Lee now! He did not. Mitchell Johnson continued to bowl. He bowled a maiden over to Tendulkar. Twice against Jason Krejza, Tendulkar had tried to hit a six on the off-side — perhaps following his sons’ advice — and twice he had been lucky that his miscue wasn’t pouched. Clearly this was a very important century for this champion player. The runs dried up for a few overs. Tendulkar was stuck on 99 for 10 balls. It was as if the game stood still for this great player. Ponting had conversations with Jason Krejza to build the psychological pressure on the man. In the end, Tendulkar got his 40th century; his 10th against Australia. He had come close to century number 40 on several occasions in the recent past. This time, even though he tried very hard to give it away, he got there. His century had taken 166 balls and came with the help of 12 4s. India had reached 277-4 off 75 overs. Simon Katich then replaced Mitchell Johnson — perhaps this was Ponting’s bid to up the over rate, which continued to be shameful. At exactly 3 minutes to 10pm AEST (4.30pm IST), exactly 80 overs had been bowled. Of these, spinners had bowled 41 overs! And still, Australia was 9 over short of where it needed to be! This was outrageous! Nothing else. Australia took the new ball immediately when it was available. India reached 300 of the first over with the new ball. India’s 300 runs had come in in 81.5 overs (3.69 rpo). Of the very next over, Sachin Tendulkar’s innings came to an end. He was LBW Mitchell Johnson for 109. Sachin Tendulkar, who was dropped twice in this innings, was out to one of the Australians who had dropped him earlier on when he was 85! This wasn’t really great bowling. Nor was there movement off the pitch. It was a decent ball. However, even with about 11 overs to go for the end of days’ play Tendulkar was already playing for the close. He had pulled down the shutters for the day and that caused him to play with a negative mindset. Just as he had got out to the new ball at Mohali after doing all the hard work earlier, here too, Sachin Tendulkar had fallen with just 20 minutes or so left in the days’ play. Australia had been let back into the game really. Not once, but several times in the day. First by Virender Sehwag’s lazy shot, then by Laxman’s lazy shot and then by Tendulkar’s shut-shop negative-mindset. India was 303-5 off 82.5 overs. Tendulkar was out for 109 off 188b with 12 4s. The partnership was worth 41 runs from 14.1 overs off a run rate of 2.89. India got to 311-5 off 87 overs when the end of the days’ play was called. Australia ended the day bowling 3 overs short despite the extension of play by half hour. So what is the Match Referee doing about this? Although India had batted well, I can’t help but feel that this was a day of missed opportunities and one concern for India. Missed opportunities because I feel Sehwag, Laxman and Tendulkar could have gone on to make more. One concern is the form and the mental state of Rahul Dravid. I am not sure what Paddy Upton is doing in/for this team. But he does need to work on Rahul Dravid to prepare him for the 2nd Innings. The way this match is shaping up, it could be a very important 2nd Innings for India and for Rahul Dravid. Australia will feel pleased. It was a solid effort from Jason Krejza. If Australia can take the remaining Indian wickets for just 50-60 runs, Australia will be well ahead in this match. The first session of play tomorrow will be crucial for both teams! At Mohali on day-1, India finished at 311-5! I do not know how they do it. But they do! They did it in the Australia-India Sydney Test in 2008 when the ICC bungled once and then again and then some more! Mike Proctor is believed to have pleaded with the ICC to appoint someone more capable to hear the Harbhajan Singh “Monkeygate” case. The ICC insisted that they needed the issue dealt with speedily. Good motives. However, they forced Proctor, a man who was incompetent in matters legal, to handle a hot potato. However, instead of a potato the ICC handed the man a grenade. He promptly blew it up and with it, himself too! The poor man was a sacrificial lamb. Another lamb in a string of broken bodies. He quietly joined the ranks of the dispensable, like Mike Denness, Darryl Hair, Steve Bucknor and many others before him! And now, in a bid to rush through a decision process on Gautam Gambhir, the ICC may have created another lamb for their slaughter-queue! Personally, I do feel that Gambhir was denied natural justice in his appeal. Albie Sachs passed his judgement without once talking to Gambhir! Surely, this just cannot be right although Albie Sachs says in his ruling that a conversation would not have had any impact on his appeal decision given that there were no significant “important questions of fact are in dispute” and given the “desirability of speedy resolution”. Question: Who desired a speedy resolution? The appellant? The BCCI? Cricket Australia? The ICC? The Australian cricket players who wanted Gambhir rubbed out of the game? My view is that “Natural Justice” affords only Gambhir the maximal right to a speedy (or otherwise) resolution. Every other stakeholder has, at best, a passing interest in the timeliness of the resolution. What is important is that justice is seen to be served and not quite the time it takes for it to be served. It would seem that, in his haste, Sachs has erred and with him, his masters at the ICC, who — it can be inferred — sought a speedy resolution. I can imagine that the BCCI would be upset at this — they are — and would pick holes in the technicalities of the appeal ruling rather than the actual ruling itself! The ruling itself was probably right! Who knows? I am a firm believer in the “you do the crime, you serve the time” principle. In that sense, I do believe that Gambhir has to take his ‘penalty’ on the chin. However, a fair process would afford any person the right to Natural Justice. If I were Gambhir, I would be upset mainly because I would have cause to feel that Natural Justice was denied in the appeals process. There are a few reasons for this and I explore these below. The main body of the appeal was built around the “disproportionate nature of the penalty imposed”, particularly bearing in mind the provocation to which Gambhir had been subjected. Although Albie Sachs did refer to the actual offence in terms that could be interpreted as grounds for leniency, Gambhir wasn’t allowed the opportunity of a full exploration of the issues around that finding of Sachs. Sachs calls the elbow an “unfortunate lapse” which could imply that, in his view, there was no pre-meditation — surely, there is immediately a case for leniency there! Sachs concludes that, “Shane Watson had raised an arm as he ran past for the first run, could have been taken by him as a mocking”. Now that is Albie Sachs’ assumption or conclusion of Gambhir’s mental state and hence, Gambhir’s conclusions at that time! In other words, Sachs has concluded that Gambhir thought Watson was mocking him by raising his arm! How could Sachs be so sure? Did he ask Gambhir? Did Sachs seek to verify if indeed Gambhir saw that as “mocking”? No, he did not. Indeed, Gambhir could make a case that that he did not quite see the ‘Watson raised arm’ tactic as ‘mocking’ but rather an attempt by Watson to elbow Gambhir on his first run, which the batsman cleverly avoided. Gambhir could then have gone on to quite conceivably make a claim that on his way back for the second run, his own elbow-thrust-out action was indeed a ‘reflex’ (consistent with his “guilty as charged but not deliberate” plea) to ensure that he doesn’t get elbowed once again by Watson while on his second run! This is all conjecture. But heck! Sachs’s conclusion was also purely conjectural and was based on the realm of the hypothetical and second-guessing! All I am saying is that Sachs has rushed to a conclusion without providing Gambhir an opportunity to put forth his case in the appeal. This is not quite true. It is, indeed, factually incorrect. The BCCI had made requests “for certain documents or recordings to be given.” These recordings are presumably voice recordings of the preceding play. Albie Sachs has left himself completely open to inspection, analysis, question and ridicule here. It is better to delay justice but reach the right decision after considering the appeal in all its fullness than rush to a final judgement in a bid to second-guess the needs of Gambhir, the Indian selectors and the viewing public on the outcome of Gambhir’s appeal ruling. Of all the statements in his ruling, I find this statement reproduced above to be the most ludicrous. Sachs cannot and should not wear the shoes of either the Indian team selectors or the viewing public. Most importantly, however, unlike the hearing in the presence of Chris Broad, the ICC Appeals process does afford a player the natural right to legal representation. This right was denied by Albie Sachs, who, in a hurry to afford clarity to the Indian selectors and viewing public rushed through a somewhat botched process to arrive at a hasty judgement, in my view. The judgement may be correct. However, with the process being ordinary at best and a mockery at worst, I feel that Albie Sachs and the ICC have left themselves wide open for a overturning of this ruling on grounds of “technical irregularities”. As I said before, I do not have a problem with the outcome, but if I were Gambhir I would have every right — on several counts — to feel aggrieved that natural justice was thoroughly denied. I am not sure what can and will happen from here on in. The ICC will not — and should not — allow a re-appeal. The process does not allow for that. It is likely that the ICC Executive Board will need to step in here and do something in a hurry. All this convinces me, if I needed convincing in the first place, is that the ICC, as it stands, is incapable of running the game of cricket. From their handling of sensitive issues to the running of major events like the World Cup, the ICC has shown itself to be a somewhat incompetent organisation. In my view, the ICC has botched one issue too many and it would seem to me that the time is appropriate to do something about it. That time is now. At the end of each Test of this series, we scored positives and negatives from the Test just Match concluded. At the end of the 1st Test in Bangalore, we scored India just marginally ahead, with 13-12. Mohali was a match in which India-dominated everything and ended up 25-0. After the conclusion of the 3rd Test, which ended in a draw, both Australia and India can take some positives. I’d like to think that Australia came out of the Test match with their noses in front… just! Both teams need to dwell on a few negatives too. For each of the dimensions below, I distributed 5 points between the two teams. In my books, both teams came out even from this Test match. Unlike the 1st Test in Bangalore, where Australia may have won had it pressed on with greater urgency — particularly in the timing of the 2nd Innings declaration — there was nothing here in the Delhi pitch to suggest that a result would be possible even if the teams had played on for another day or two! However, after facing a huge mountain, Australia played exceedingly well to come within spitting distance — had to use that term as a tribute to Big Merv, who is there in India at the moment — of the Indian total! Not many teams would have been able to put up such a creditable backs-to-the-wall effort. Australia did, and full marks to them for having done so. India played 1 bad days’ cricket in 10 days and that basically cost the team. If the Indian team had held its catches, it is remotely likely that India may have gone into the 4th Test 2-0 up! Instead the teams go to Nagpur with a draw sufficient for India to regain Border-Gavaskar Trophy (BGT). Australia needs to win to draw the series and to retain the BGT. Australia will need to make all the running at Nagpur. India, however, can be satisfied in the continuance of a recent trend (albeit, bucked by the tour of Sri Lanka). Often, India’s famous wins have been immediately followed by an embarrassing loss. Adelaide 2003 and Johannesburg, December 2006 are painful examples. To erase this blot was an important step that India needed to make in order to make that move from being a good team to a very good team. Consistent performance is what great teams, like Australia, are able to bring to the table. More recently, however, India has been putting in performances like The Oval, 2007 (although I still feel that India should have gone for a victory there) and Adelaide, 2008. And there are other recent examples. Although Colombo 2008 bucked this trend, I do feel that India is slowly turning the corner when it comes to consistency of performance pressure. From that point of view, a draw is something that India will take gladly out of the Kotla game. A draw was, of course, a terrific result Australia. It keeps Australia in the series. But, unlike Bengaluru (where Australia won 14 of the 15 sessions of the Test match and still drew! ), at Kotla, the SBS Score Card at the end of the game read 7.5-7.5! This was an even Test match. Hence the 2-3 score to Australia on this dimension. I start this by noting that India is the only team that has taken 20 wickets in a Test in this series! At the Kotla, although neither team looked likely to take 20 wickets, only India made something happen with the ball. Even in the 2nd Innings it was more through batting laziness and batting sloppiness that Australia got the four Indian wickets (I am not counting Ishant Sharma’s night-watchman wicket here). The Australian pacemen were bowling up-and-down stuff and the spinners didn’t do much at all. A concern is that Stuart Clark has just taken 2 wickets in this series thus far — and one of them is Ishant Sharma! That wasn’t quite the case with the Indian bowlers though. The new ball bowlers made something happen. Amit Mishra, playing in only his second Test match will have learned a lot from the Kotla experience. And Virender Sehwag was a total revelation. Given that India did not have Harbhajan Singh and given that Anil Kumble was out of the Test match for a long period at a crucial time, I thought India came out of this department with a slightly better edge. On this tour, given a slightly more responsive pitch — with more turn through the middle and a bit more bounce — I have greater confidence that the Indian bowlers will use it than I am of the Australian bowlers. With Harbhajan Singh slotting in for Anil Kumble, I do not see a major change in India’s bowling stocks for the Nagpur Test match. Australia looks somewhat bereft of ideas in the bowling stakes and needs a bit of an overhaul in this department. It would all depend on the pitch, but Australia does need to look really hard at Jason Krejza. I can’t see the value to the team of Cameron White, especially if he is used after Michael Clarke as a bowler! I score Australia ahead in this dimension because of the splendid backs-to-the-wall effort by the team. Not many teams can play as well as Australia did to wipe out a 613 run deficit! The pace was set by the assured manner in which Matthew Hayden and Simon Katich opened. This Zen-like pace was continued right through the innings. Every batsman chipped in and contributed to the team-cause. It wasn’t the most pretty sight, but it doesn’t need to be. Australia has often confused aggression with attractiveness. Ask Gavaskar and he’ll tell you that you can be aggressive even in tight defence! That is what khadoos cricket is. And that is what Australia played. They didn’t let the opposition into the game and slowly shut the door on an Indian victory. Of course, this followed the khadoos effort of the Indians in the 1st Innings. There are two reasons I give the Australians the edge in this dimension though, (a) All Australian batsmen contributed, while for India, Sehwag and Dravid did not contribute, (b) It is not easy to carry out a backs-to-the-wall effort so clinically and with an absence of panic. I can’t see Australia changing its batting composition or order. India, however, will need to get Laxman in at #3 and, unfortunately, this means that Dravid drops to $5 in the Nagpur Test match. This is necessary in my view. This is not really a surprise. There were quite a few lapses in the field from India, particularly on day-4. A few run-out chances went begging. A few sharp chances — particularly close-in — were spilled or not attempted. India does need to lift its game in this regard. Unlike the Bangalore effort, I thought Gautam Gambhir was much sharper at forward short-leg in Delhi. This augurs well for India. However, it is the out-fielding that is of greatest concern. One would have thought that under Dhoni, the fielding intensity would pick up a notch. But strangely, the worst fielding commenced when Dhoni was in charge! Having said that, I am not sure we need to see the captain stomping around in an open demonstration of displeasure. The only reason for scoring this even was because of India’s poor intensity on day-4. Ironically, this phase commenced when Dhoni was captaining for Anil Kumble! I thought Dhoni’s tactics in opening with Zaheer Khan and Amit Mishra was a bit strange. Moreover, continuing a somewhat listless Zaheer Khan for a while longer than necessary was also similarly strange. The best bowlers the previous day had been Ishant Sharma and Virender Sehwag and they ought to have opened. Moreover, it may have been easier for Virender Sehwag to bowl with a slightly newer ball which was only 5-6 overs old! Having said this, had Ishant Sharma caught that catch off Amit Mishra’s bowling, who knows how the match would have ended up? But more importantly, it was the lack of intensity on the field on day-4 that the Indian captains (Kumble and Dhoni) need to take responsibility for. It seemed that the Indians had decided that all they needed to do to win the match was to show up on day-4! Australia would have been way ahead in the leadership stakes but for the somewhat bizarre choices that Ricky Ponting made on the field. He under-used Simon Katich and over used both Shane Watson and Michael Clarke in my view. Simon Katich, the finger spinner, was more likely to cause damage than either Michael Clarke or Cameron White! So, in terms of the overall result, I score it: India-12, Australia-13! Overall, Australia can perhaps claim to be marginally ahead at the end of the 3rd Test… just! And that is mainly due to the tremendous batting effort. However, Australia has to make all the running at Nagpur. I do see a danger for Australia in the sense that the bowlers have not really looked likely to take batsmen out and India is the only team to have taken 20 wickets in a match in this series thus far. Harbhajan Singh should return for India and that should, if nothing else, spice things up! Gautam Gambhir, if he plays, will need to share Chloe Saltu’s headlines with Harbhajan Singh, the player rather than Harbhajan Singh the spectator! Anil Kumble will be there to see if his ‘Vision’ for Indian cricket is in safe custody. I believe it is. He will want to see that the job that he started will continue through. Sourav Ganguly will be playing his last Test match and V. V. S. Laxman will be playing his 100th Test Match at Nagpur. Had Kumble played too, five India players will have played 100 or more Test matches in the same Test match — not sure how often that has happened in a Test match! But all of this will be somewhat irrelevant when the two captains stride out for the toss at Nagpur. It should make for a cracker of a Test match there.